Hey, are you a fan of the cult favorite television series Twin Peaks? 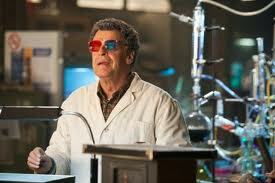 Then you'll love the reference to one of its characters in this episode of Fringe! All the details can be found in my books Crossovers Expanded Vols. 1 and 2. AUTHORIZED companions to Crossovers: A Secret Chronology of the World Vols. 1 and 2 by Win Scott Eckert, they will be released by Meteor House in July!